Prove Bigfoot does exist in this adult costume! The funny animal suit features a hood mask that includes a latex face with open eyes and nose holes. 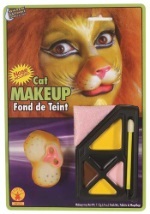 The high-quality mask includes latex ears and a full head of synthetic hair. The body suit has an open back that you can step into with ease and ties behind the neck. The gloves have realistic rubber fingers and fur on the top of the hands while the feet have rubber on the soles. This is a great costume for the upcoming Halloween season!